Sagittal section of right orbital cavity. The levator palpebrae superioris (Latin for: elevating muscle of upper eyelid) is the muscle in the orbit that elevates the superior (upper) eyelid. The levator palpebrae superioris originates on the lesser wing of the sphenoid bone, just above the optic foramen. It broadens and decreases in thickness (becomes thinner) and becomes the levator aponeurosis. This portion inserts on the skin of the upper eyelid, as well as the superior tarsal plate. It is a skeletal muscle. The superior tarsal muscle, a smooth muscle, is attached to the levator palpebrae superioris, and inserts on the superior tarsal plate as well. 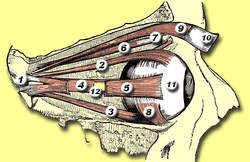 As with most of the muscles of the orbit, the levator palpebrae receives somatic motor input from the ipsilateral superior division of the oculomotor nerve. 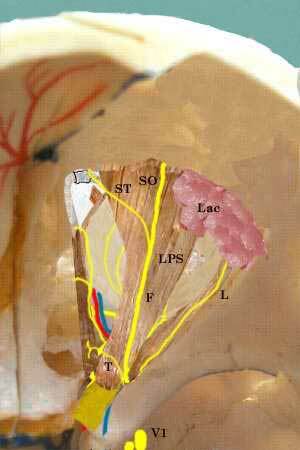 An adjoining smooth muscle, the superior tarsal muscle, which is occasionally confused to be a portion of the levator palpebrae superioris, is actually only attached, and it is separately innervated by sympathetic fibers that originate in the cervical spinal cord. The levator palpebrae superioris muscle elevates and retracts the upper eyelid. Damage to this muscle or its innervation can cause ptosis, which is drooping of the eyelid. Lesions in CN III can cause ptosis, because without stimulation from the oculomotor nerve the levator palpebrae cannot oppose the force of gravity, and the eyelid droops. Ptosis can also result from damage to the adjoining superior tarsal muscle or its sympathetic innervation. Such damage to the sympathetic supply occurs in Horner's syndrome and presents as a partial ptosis. It is important to distinguish between these two very different causes of ptosis. This can usually be done clinically without issue, as each type of ptosis is accompanied by other distinct clinical findings. The right eye in sagittal section, showing the fascia bulbi (semidiagrammatic). Extrinsic eye muscle. Nerves of orbita. Deep dissection. This page was last edited on 27 November 2018, at 14:50 (UTC).